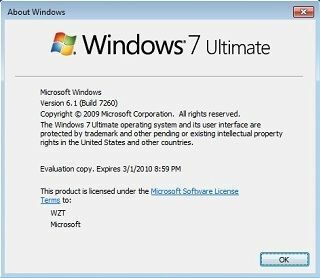 Windows 7 Build 7260 is thought by many to be the RTM build of Windows 7, which if it’s true, the final Windows 7 released to consumer will have build version 6.1.7260.0. The assumption was mainly caused by the fact that Windows 7 Build 7260 is the first build to have win7_rtm as its branch. Actually Windows 7 is just one of the candidate for RTM, and has since been leaked to Internet. Again, the leaked Windows 7 Build 7260 is in VHD image format to mount at virtual machine. 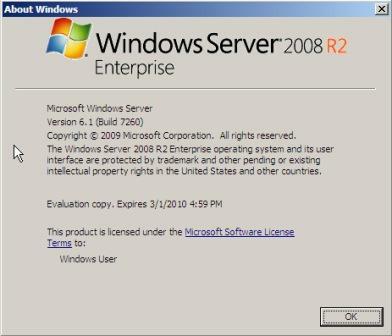 Only 32-bit (x86) version of Windows 7 Client Build 7260 and 64-bit (x64) version of Windows 7 Server (Windows Server 2008 R2) are leaked, in a twisted similarity to Windows 7 Build 7231 and Windows 7 Build 7232. Windows 7 Build 7260 has full tag string of 7260.win7_rtm.090612-2110, indicating it’s compiled and signed off on June 12, 2009. For people looking for Windows 7 Build 7260 installation ISO, several ISO has been built from the VHD images, by using loader from Windows 7 Build 7201 IDS or Windows 7 RC Build 7100, with original install.win from Windows 7 Build 7260. Do note that build 7260 does not support other version of loader installer, where an error will pop up after first reboot during the install, indicative of a problem. Torrent will download the following RAR file, which contains the ISO image in the archive. Free Windows 7 RC product keys appears to be still working to activate Windows 7 Build 7260.